What are the benefits of enrolling my child in these classes? Our classes are designed to be dynamic, fun, and educational for young children. Classes are active and playful and combine physical fitness with positive life skills training, practicing focus, patience, and socialization with fellow peers. Boys and girls ages 8-13 who want to try new things and improve themselves. Our program is for kids who want to have fun and for parents who want their kids to acquire their greatest physical and mental potential. 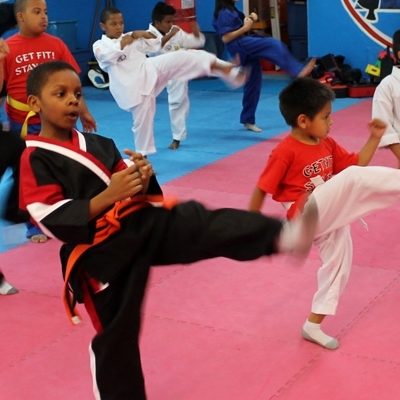 Martial Arts is the base for all athletic activities. They help kids kick strong, run faster, jump higher, and they improve aim. Whether you are 16, 30, or 60 and want to tone your body, get stress relief, learn skills to defend yourself, gain more confidence, have more discipline, make friends, or just have fun, RTK Martial Arts has a program for you. There is nothing better than developing your mind and your body at the same time. And martial arts is the way to go. Come Take a Free Class With Us Today.